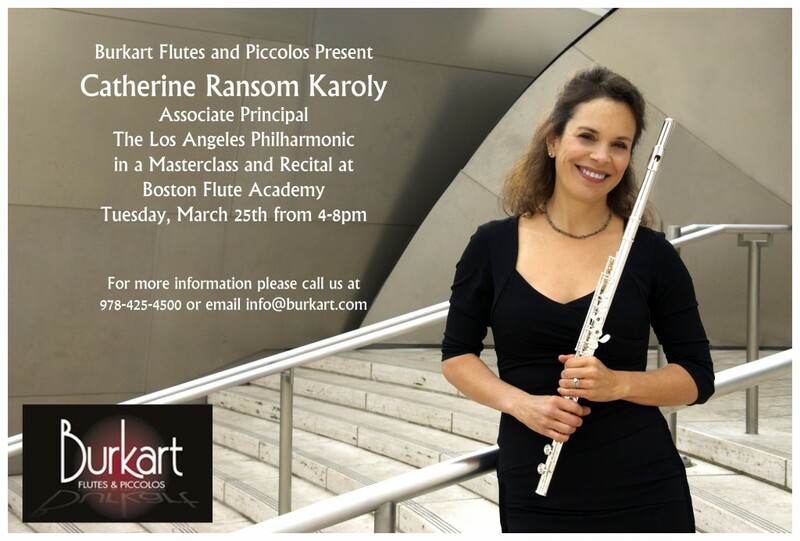 Catherine Ransom Karoly, Associate Principal Flutist with The Los Angeles Philharmonic, performed a breath taking recital and taught an inspiring Masterclass at Boston Flute Academy on Tuesday, March 25th, 2014 from 4:30-7:30pm. Flutists in the audience also enjoyed trying out Burkart flutes and piccolos. This event was free and open to the public. BFA extends special thanks to Burkart Flutes and Piccolos for sponsoring this event and presenting Cathy Ransom Karoly at BFA. For more information, including the detailed schedule & repertoire performed, please click here.